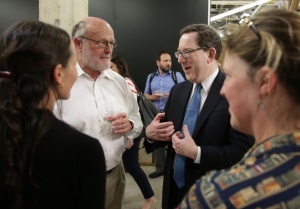 UO President Michael Schill, Eugene Mayor Kitty Piercy and UO alumnus Allyn Brown cut the ribbon on the UO’s new downtown innovation hub Tuesday afternoon and declared the 12,800-square-foot space known as 942 Olive Street officially open. Emphasizing innovation, partnerships and opportunities, Schill thanked the numerous contributors to the project, including the The Alice C. Tyler Perpetual Trust, which supported the creation of the building’s key tenant, the Tyler Invention Greenhouse. The Tyler Greenhouse aims to leverage UO expertise in green chemistry and connect entrepreneurs and product designers to bring to market sustainable products that are safer for the environment and for human health. 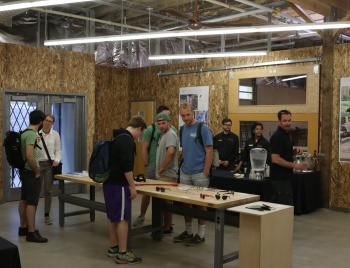 Following remarks by Piercy and UO chemistry professor Jim Hutchison, more than 120 invited guests toured the industrial space, defined by corrugated plastic and chalkboard walls, unfinished wood sheathing, concrete floors and a colorful coffee bar made out of reclaimed wood. UO students and faculty members from an array of departments will share the meeting and event spaces with local entrepreneurs, creating opportunities for cross-pollination and exposure to real-world business activity. In addition to the Tyler Invention Greenhouse, which occupies the southeastern portion of the space, 942 Olive Street is home to the university’s Product Design Program. The Product Design Launch Lab features a design studio, computer-assisted design lab and a polymer lab in the western portion of the building. The Eugene branch of the Regional Accelerator and Innovation Network — a collaborative program to help create companies and jobs in the southern Willamette Valley and known as RAIN — occupies the northeastern section of the building and includes rooms for training and meetings and a community workspace where business founders can come together and share ideas. The 24-hour facility will be accessible to students, faculty, RAIN staff and RAIN accelerator companies with key cards. The three occupants have their own devoted sections, but 942 Olive Street boasts numerous shared spaces and is intentionally designed to foster interaction and collaboration between students, entrepreneurs, researchers and others innovators. It brings the latest ideas in sustainability and green chemistry, product design studios and RAIN’s entrepreneurial activities together under one roof in the heart of Eugene’s burgeoning innovation district, say innovation experts such as management professor Andrew Nelson, the UO’s executive director of RAIN activities. “When students go to class there, what they will do is engage with actual, real companies coming through the RAIN accelerator, helping those startups with things like market analysis and helping them figure out who the competitors are,” Nelson said. “The whole point of this space is that it gets students from thinking about that theoretically or as a classro om exercise to actually being in a space with entrepreneurs who are building their companies at the same time in that space." Many visitors to Tuesday’s grand opening remarked on the building’s raw, industrial look, which melds the old and the new. Occupants such as Joe Maruschak, director and chief startup officer of RAIN Eugene, say the unvarnished space is intended to inspire its occupants to build something — whether that be a new compound, a prototype or a successful startup company. Exposed brick and other original architectural elements from the 1908 building are visible, but the modern space features labs and design spaces outfitted with tools such as a 3-D printer and a laser cutter. Two “phone booths” provide privacy for making cell phone calls and Skype calls, and the building is outfitted with high-speed internet access courtesy of the downtown fiber project backed by the city of Eugene and the Eugene Water & Electric Board. The Olive Street building has been several years in the works. It was sold to the University of Oregon for $1 in the spring of 2015 by the city of Eugene through its urban renewal agency, and the building underwent a $3 million renovation. The project was funded by $1.25 million allocated by the state Legislature through RAIN, and the UO contributed an additional $1.25 million. The Tyler Invention Greenhouse was founded with a $500,000 gift from the Alice C. Tyler Perpetual Trust. For more information on 942 Olive, visit the UO's Innovate website.